Corolle's Mon Premier Carry Bed is an ideal resting place for a 12-inch baby doll (sold separately). 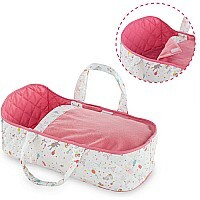 Made of soft quilted fabric in a charming bunnies print, this lightweight carry bed makes it easy for a child to take a favorite baby doll along wherever they go. Corolle's Mon Premier Carry Bed is perfect for make-believe moms and dads on the go. Made with soft but sturdy quilted fabric in a charming bunnies print, it's lightweight and easy for little ones ages 18 months and up to handle. The Mon Premier Carry Bed keeps a favorite 12-inch baby doll comfy whether napping, on the go to play dates or from room to room at home. Corolle's Mon Premier Carry Bed fits baby dolls up to 12 inches tall. Little ones love taking care of their baby dolls the way their parents take care of them. Designed in France, the Mon Premier Carry Bed is part of Corolle's Mon Premier Collection that offers everything make-believe moms and dads ages 18 months and up need for nurturing pretend play with their favorite Calin or Bath baby doll (each sold separately), whether it's dressing, feeding, on the go, at bath time or at bed time. Corolle's Mon Premier Carry Bed is the winner of a Platinum Seal Award from The Oppenheim Toy Portfolio, the only independent consumer review of children's media. The Platinum Seal Award is their highest honor. One Corolle Mon Premier Carry Bed.